In the upcoming months, the world will anxiously watch as President Trump is set to meet with North Korea’s Supreme Leader, Kim Jong-un, making it the first time a sitting American president will convene with a leader from the Hermit Kingdom. Although the exact date and location have yet to be established, this summit will no doubt be a historical one. The two outspoken leaders plan to discuss the easing of tensions between the two nations, as well as the possible denuclearization of the Korean Peninsula. Both countries’ willingness to come to the table and discuss peace may possibly mark the end of a decades-long conflict between the United States and communist North Korea, a conflict which has undoubtedly heated up over the past year. On March 5, 2018, a delegation of South Korean leaders made a historic visit to North Korea and met with its leader, Kim Jong-un. Among those in attendance was South Korean National Security Adviser Chung Eui-yong. Three days later, on March 8, Chung visited President Trump at the White House. He informed the president that Kim Jong-un had expressed a strong desire to meet with the United States, especially Trump himself. President Trump accepted the offer and agreed that they will meet by May of this year. Tensions between the United States and North Korea have lasted decades. Following World War II, Korea was split into two nations, the Democratic People’s Republic of Korea (North Korea) and the Republic of Korea (South Korea). On June 25, 1950, North Korea, a communist country backed by the Soviet Union and China, invaded South Korea, signaling the start of the Korean War. South Korea, a democratic and capitalist country, was backed by many other capitalist nations, especially the United States. The war lasted for a little more than three years and ended on July 27, 1953, with the signing of the Korean Armistice Agreement. This agreement brought the fighting to an end and created the Demilitarized Zone, otherwise known as the DMZ, at the 38th parallel of latitude. Although both sides of the conflict agreed to stop the fighting, no peace treaty was ever signed, meaning the war technically never ended. The United States, which supported its democratic ally in the south, suffered more than 36,000 deaths in the war. America’s involvement in the Korean War was part of its Cold War Era policy of containment, which had the goal of preventing the spread of communism. Today, the United States has more than 20,000 troops stationed in South Korea. The United States has since tried to make peace with the North Koreans. In October of 2000, then-Secretary of State Madeleine Albright went to North Korea and met with its leader, Kim Jong-il. Albright and the Clinton Administration sat down with the communist regime in an effort to further freeze North Korea’s nuclear program. Negotiations had appeared to be going well, and Secretary Albright even discussed the possibility of President Bill Clinton making a visit to the country before the end of his term. However, talks soon broke down, and Clinton did not meet with Kim Jong-il until 2009. In 2006, North Korea conducted its first nuclear missile test, despite the international community’s concerns and warnings. While running for president in 2008, then-Senator Barack Obama said that he would be willing to sit down with the North Koreans, but when Kim Jong-il died in 2011, his son, Kim Jong-un, assumed power, and all hopes of a potential breakthrough fell apart. Since then, relations between the United States and North Korea have been at an all-time low. Under Kim Jong-un, North Korea has conducted more than eighty missile tests. On July 4, 2017, the regime fired its first ever intercontinental ballistic missile (ICBM), capable of striking Hawaii and Alaska. Later in the month, on July 28, they tested another ICBM, this time with the capability of reaching as far east as New York. The most threatening missile test of all came on November 28, 2017, when the communist state fired another ICBM, this time into the Sea of Japan. US Secretary of Defense James Mattis said that it went higher than all of their other previous missile launches. North Korea considered their November 28 test as a huge success, claiming that it was capable of hitting anywhere in the United States. This is the most recently known test conducted by the North Koreans. Throughout 2017, North Korea conducted 16 missile tests, using a total of 23 missiles. The rogue state did not just test missiles, but also actual weapons of mass destruction, including a hydrogen bomb on September 3, 2017. Relations between the Koreas improved around the time of the 2018 Winter Olympics, which took place in Pyeongchang, South Korea. North Korea had agreed to participate in the games, and they even sent Kim Yo-jong, the sister of Kim Jong-un, to watch and discuss policy with the South Koreans. Kim Yo-jong met with South Korean President Moon Jae-in on February 10 and invited him to meet with Kim Jong-un in Pyongyang, North Korea. During the Olympics, both the North Korean and South Korean teams walked together under one united flag, marking a symbolic moment in the advancement of the peace process between the two nations. Following the Olympics, talks between both Koreas were sustained, and relations continued to improve. Kim Jong-un and Moon Jae-in are set to meet on April 27, their first-ever meeting with each other. On March 28, 2018, Kim made his first foreign trip since assuming power in 2011, meeting with Chinese President Xi Jinping on an unannounced two-day visit to Beijing. President Trump has made it clear that sanctions installed on the North Korean regime over the past year will remain until their meeting. He has also stated that the United States will continue to pressure Kim Jong-un and North Korea to give up its nuclear program until an agreement is made. White House Press Secretary Sarah Huckabee Sanders said, “We look forward to the denuclearization of North Korea. In the meantime, all sanctions and maximum pressure must remain.” The North Koreans also promised not to test any missiles or weapons in the time leading up to the summit. Kim Jong-un and his regime have expressed serious interest in denuclearization. However, many political pundits are skeptical about the sincerity of the North Korean leader. The true cause for the sudden change in behavior of the Korean despot is also certainly interesting, and it may be due to the overwhelming amount of poverty his state has endured as a result of countless sanctions, as well as fear of an actual violent confrontation with the United States, which he knows would be devastating to his country. It is estimated that about forty percent of North Koreans live below the poverty line, and food shortages have left millions to starve. What Kim may want in return for completely abolishing his nuclear program also remains unknown, although it is likely financial support for his impoverished nation, as well as the end to all economic sanctions placed on his regime. When President Trump finally sits down with the North Koreans, he will have a different team of advisors from just a few weeks ago. Among the biggest changes in Trump’s cabinet has been the termination of Secretary of State Rex Tillerson. On March 13, less than a week after President Trump had agreed to meet with Kim Jong-un, the president announced on Twitter that Rex Tillerson would no longer serve as his top diplomat. To replace Tillerson, President Trump nominated Mike Pompeo to serve as the country’s 70th Secretary of State. Pompeo, who is currently the Director of the Central Intelligence Agency, will become the first American to have served as both CIA Director and Secretary of State. Replacing Mike Pompeo as Director of the CIA will be Gina Haspel, who has worked for the agency since 1985. If confirmed by the Senate, Haspel would become the first woman in US history to serve as CIA Director. President Trump will also go into the North Korean summit with a new National Security Adviser in John Bolton. Bolton, the former United States Ambassador to the United Nations under President George W. Bush, is now serving as President Trump’s third National Security Adviser in less than fifteen months. The news of this broke on March 22 when Trump tweeted that he would be replacing General H.R. McMaster with Bolton, effective April 9. The upcoming meeting between President Trump and Kim Jong-un will no doubt be a historical one, but whether it will be successful is still unknown. Both sides appear to be confident that they will reach some sort of an agreement, perhaps one denuclearizing North Korea altogether. If that is the case, it would undoubtedly be a remarkable achievement for Donald Trump’s presidency and the entire world. It would resolve the decades-long hostilities between the United States and North Korea with diplomacy, rather than a potential nuclear war. However, this meeting will carry an unprecedented risk. 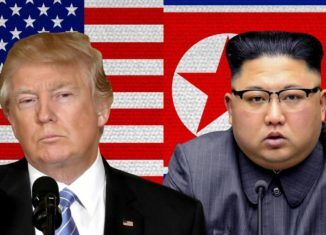 By having Trump and Kim meet with each other, both nations are gambling on the possibility of the dispute being worked out diplomatically from the very top. If both sides fail to come to an agreement and again walk away from the table unsatisfied, then very few options remain for the United States in dealing with a nuclear North Korea. It is an extremely ominous, yet not unlikely notion to consider another breakdown in relations between these two nuclear powers, and it is certainly a thought that the entire world will nervously consider throughout the remainder of these paramount negotiations.